We launch with the goal to go beyond the generic three levels of IT. The mission: To provide expert technology service that contributes toward business growth, and tackle problems the right way. We are survivors of the 2010 recession solely because of our commitment in always serving our customers to the best of our capabilities. One-hundred percent of our clients refer us to their business associates, proving to us that we’ve earned our name. We’re more driven to continue our mission than ever before. A limited workforce means we must hustle that much harder to deliver our promises to clients. We begin to see the results of our hard work; motivating us to strive to do even better. With new clients committed to us, we increased our workforce and setup offices in strategic locations to provide better services. With over 300 projects completed, 22 staff members, multiple offices and strong partnerships with Microsoft, Dell, HP, and Barracuda, we steadily continue to grow and learn. Almost all businesses have some form of technical assistance. Whether it’s from internal staff, friends, family members, or the owners doing it all themselves. Managing technology can quickly become overwhelming and costly if the wrong decisions are made. All businesses should be able to make intelligent and informed IT decisions, regardless if they’re a multi-billion-dollar corporation with in-house resources or a small mom and pop shop. We want to ensure our clients — mid and small-sized businesses — have this capability. We want to empower them by helping them to build their own IT teams that are just as sophisticated as any other corporate business. After working for more than a decade in corporate IT, Mr Renjith Roy started Level4 IT with a passion to enable small and medium-sized businesses with the best possible IT Management and IT Consulting, with a focus on IT Security and Disaster Avoidance. The odds may have been against him, but the result of his persistence has been proven with Level4 IT growing to more than 100 clients and over 300 completed projects. This hard work and enthusiasm to serve everyone with the best, is infused into the DNA of the team he has built thus far. Level4 IT has struck the rare balance of staying on top of the most dynamic technology available today, while maintaining affordability for its clients. We use the best in-market technology to make IT reliable and safe for our clients, while always keeping the bar high with respect to standards for quality. To provide white-glove IT Management services for businesses that need to elevate their way of dealing with the ever-changing technological landscape, and to guide businesses seeking service into the future. More than 10 years of experience in Information Technology enables us to see every business anew. We have proven efficiency in leveraging our resources to provide the best suited cost-effective solution for your business. We are passionate about staying up to date with technology and have figured out how to keep it affordable. Solution: Sherry hires Level4 IT to consult on the issue. We conduct research on Sherry's behalf and notice an obvious need for a centralized server-based network. We then conduct additional research, contact several vendors, negotiate prices and create a cost-effective, Microsoft Server solution that solves her current dilemma as well as provide her with an ample amount of room for growth. Central server with Microsoft Server 2008 setup for centralized file and print sharing. In addition, each employee receives a custom account to access the network as well as the ability to save important files and documents to their personal folders. Microsoft Exchange so that each employee has access to an email account which can be accessed internally through Outlook and externally through their Smartphone or Web Application. Wireless Network: A secured wireless network is setup for internal users only. Virtual Private Network (VPN): Secured VPN connections are setup for specific employees to access network resources remotely. This purpose of this solution is to provide the business owner with Flexibility, Mobility and Security with plenty of room for growth. This solution will allow users to share files, centrally maintain future applications, backup all resources automatically daily, and give employees the ability to work remotely. 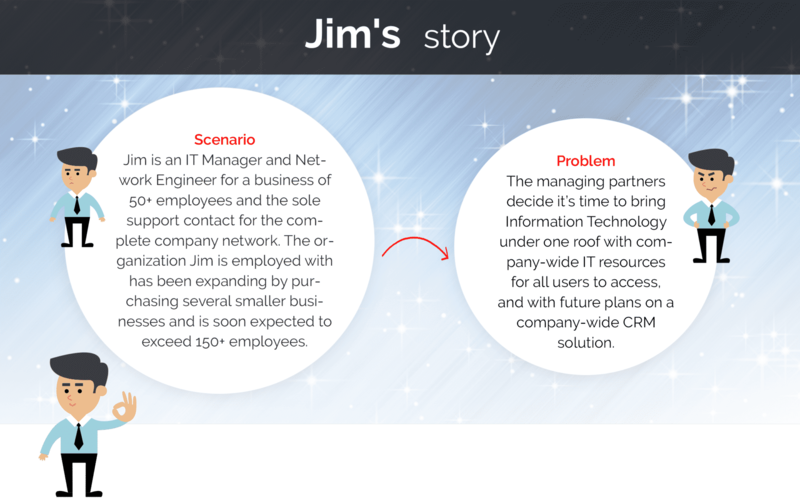 Solution: Jim and the company decide to hire Level4 IT to help with the initial project as well as assist Jim hire qualified IT employees and help establish an IT department. We first setup a long-term project plan and bring in our own consultants to help Jim negotiate and purchase the equipment. We also help Jim find a suitable co-location facility with adequate power and redundancy, to setup and initiate the project. We find key individuals with a background and experience in Microsoft, Cisco, and other technical qualifications needed for the project and begin the initial installation and setup. Once the infrastructure is setup, we help Jim (newly promoted CIO) interview and source out several qualified individuals to assist in the ongoing support of the Network and users. We help Jim hire a Senior Network Engineer certified in Cisco Routing, a Microsoft Certified Engineer and a Jr. Project Manager. We then hand over all support and operations of the new IT dept over to Jim and his employees. Having a versatile partner like Level4 IT can help a business act quickly by leveraging resources it doesn’t immediately have. Level4 IT has access to qualified individuals and can help initiate and manage projects from day one!